The first magazine article I wrote that was accepted by a national magazine was entitled, “David Wilkerson and Me.” In the piece, I chronicled how much his book, The Cross and The Switchblade had been used by God to change my life. My husband and I had just moved to Central Florida. I was a brand new mother when a new friend came to the hospital. She gave me Wilkerson’s book. Because I respected her, I read it with fascination. This, Wilkerson person, was a young man–only 10 year older than I–but he had something in his Christian life that I didn’t have. Yet, I desperately wanted whatever it was that he had. He was able to share Jesus with people on the streets or in a small crowd. New York City gang leaders became Christians. Drug addicts were set free by God’s power. During my stay in the hospital, nursing aids and orderlies came to my room to “hang out.” This was a new experience for me. I’m not a magnetic personality but they came and they wanted to talk. Several of them burst into tears and asked my help. I was dumbfounded, scared and speechless. No matter how hard I tried, I could not tell them about my wonderful Savior. There was no power in my life, even when people were asking legitimate and heart wrenching questions. At night, when the TV was off and only one light was shining, I would pull out my book. I read and I cried. Why couldn’t I tell these hurting, hungry women about the wonderful Lord who gave me peace. When a woman twice my age poured out her heart because her son was fighting an unpopular war, I sat numb and speechless. When perky Maria talked about her boyfriend who was sick and could be dying, I could only smile and hold her hand. I began a search through the Scriptures for what made Wilkerson different. I wanted what he had. I needed the power of the Holy Spirit to reach out and touch me because I’d seen a small glimpse of a hurting world who desperately needed the Lord. In God’s time, I discovered what Wilkerson had found and so did millions of other people. From the Jesus Movement of the 1960’s, the Church in the US was radically changed. All of us still feel the affects of the outpouring of God’s Spirit on our nation. Things changed from the music we sing to the length of our sermons to the way the Bible is taught. Sure, not everything that happened was good but much of it was holy and powerful. I don’t live in the past. I don’t even miss the past. There are many wonderful days ahead. 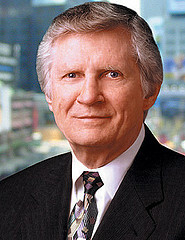 However, with the death of David Wilkerson, it seems good to stop hoeing God’s fields for a moment. It’s a time to lean against my hoe and catch a vision of the past fears and God’s glorious release. It’s time to reflect and rejoice in a young man who dared to follow God’s calling, risking all to “go into the highways and hedges and compel” us to come in. His godly influence reached more than the gangs in New York City. God’s spirit touched a young mama sitting in a hospital bed, crying out for more of the Lord. Who is someone who has influenced your life for good? What books have helped you to know God better?